UL Certified and using Aerovox capacitors, our 1000W Crop King Magnetic Ballast is great for the conservative budget. It can mount to walls and ceilings, features a convenient transport/hanging handle, is multi-voltage capable (120/240V), and features two universal sockets, making it compatible with all reflector types. This ballast's constant wattage output means no lamp flickering and with the flip of a switch it can be converted from MH to HPS ballasts. 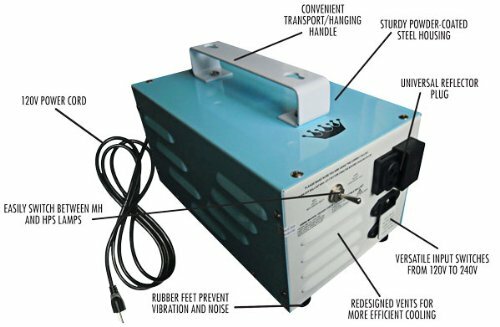 The Crop King has rubber feet to reduce noise and vibration, comes with a 120V power cord, and sports a two-toned blue and white steel housing. All magnetic ballasts have a 30-day warranty.